I had time on my hands for lunch in between meetings during a recent business trip to SF. Instead of grabbing a sandwich, I decided to stop by Hog Island Oysters in the Ferry Building for a quick bite. 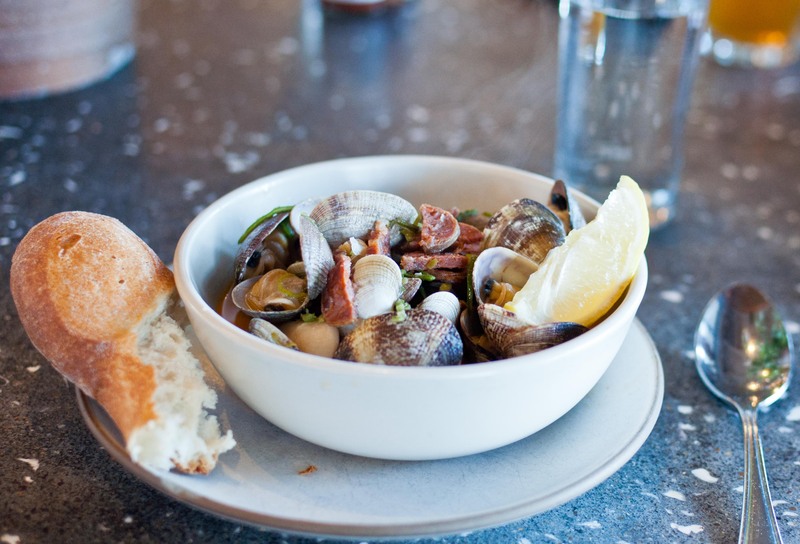 This was my second time dining at Hog Island and since the first time was merely to sample oysters, I was excited to try the rest of the menu. A nice sunny day in the middle of February in San Francisco brought people out in droves to the sun drenched board walk by the water. 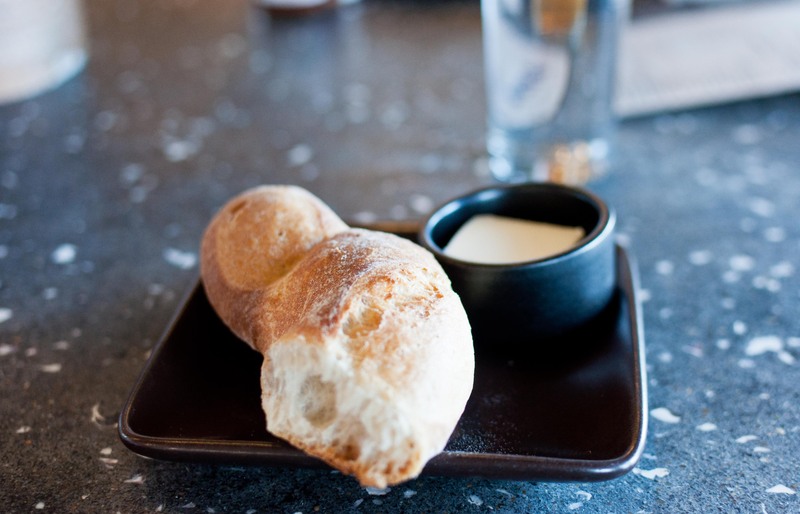 I chose a seat at the bar facing the water and nibbled on simple crusty french bread and butter while people watching. My lunch started out with a bright and colorful curly cress salad. 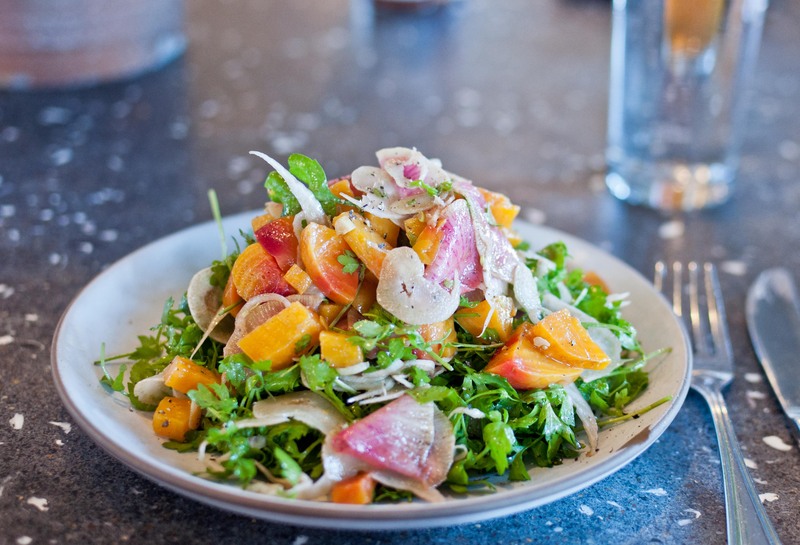 The tender greens were topped with sweet pieces of golden beets, shavings of watermelon radishes, fennel and spring onion. All of this was topped off with a light vinaigrette. I loved the crunch, the sweetness, and the spiciness that the mix of fresh ingredients brought. To follow up the salad, I chose the steamers made of manila clams. This was one of the lighter choices on the menu with a white wine broth. Fresh manila clams were simmered with corona beans, leek tops and chorizo. The best part was dipping what was left of my crusty bread into the savory spicy broth. Happy with my choices for lunch, I left the Ferry Building feeling satiated and ready to tackle the rest of the day. If only I could have a lunch like this every day, how happy would I be? You should try the gumbo! Only served on Sundays. I had it yesterday, and I always make it a point to stop in and see the crew at the Ferry Market Building when I’m in town. Wish they were in Long Beach!